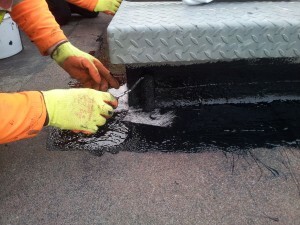 Leeson Watertite®, our liquid applied roofing system, continues to go from strength to strength. The system was recently installed on 1,000sqm of guttering, to remediate an alternate system which was allowing the ingress of water. The 20 year version was selected by the client, and the versatility of the product allowed the necessary detailing work to be completed quickly and effectively, over a wide variety of substrates. The completed project was quickly returned to service, keeping out the standing rain water.